Mike Rogers writes: I was at my son's school the other day and got into a conversation with a friend who is the chief of Japan operations for Korea’s electronics giant, Samsung corporation. His son and my son are in the same class again this year and so it was very pleasant to see him and talk. During that talk, we came to the subject of how Samsung is dominating the market in flat screen TVs and moving that direction in the hand held computers and cellphones field too. In August of this year, the Wall Street Journal ran this article entitled, "How Japan Lost its Electronics Crown"
Now, Japan's device makers are an afterthought to Apple Inc., Google Inc. and South Korea's Samsung Electronics Co.
Or, how about this interesting tidbit from Marmot Hole a blog about Korea? And you thought Samsung was big enough already since it accounted for more than a fifth of Korea’s GDP. The Wall Street Journal reports that Samsung Electronics’ operating profit, at $3.14 billion, is more than two times larger than the combined operating profit of nine of Japan’s largest consumer electronic companies. Samsung now has a $7.4 billion war chest to spend on growth and R&D where many of the Japanese companies are at an operating loss (Sony) or in huge debt (Hitachi). These articles touch on some very important points, like value of yen and style issues, but both my Samsung friend and I agree that the biggest problem for Japanese companies versus Korean companies in today’s world may not be simply issues with design and ease of use, but it has a lot more to do with corporate culture in Japan. Frankly speaking, from what I've seen, Korean companies will continue to beat Japanese companies for the foreseeable future. There's no way out. Why? Because inside a Korean company, there are no factions fighting for position like what goes on at a Japanese company. "At a Korean company everyone is on the same bus and we are all going the same way. At a Japanese company, the leaders have a very difficult time getting everyone pointed in the same direction." At a Japanese company groups are struggling within, and against each other, to gain power. At Korean companies, I gather they feel it is "Korea versus the world!" When I worked as an executive at a major Japanese TV station subsidiary, I saw a consistent infighting between three or four factions for power. When faction "A" would come to power, the other factions seemed to not put in their best effort. In fact, I saw times when the other factions would actually drag their feet and become a hindrance to the efforts of the group in power; and, in turn, a hindrance to corporate profitability. It was infuriating to me as a foreigner who wasn't inside of any group to see people protecting their friends and their position as the number one work priority rather than the success of the company business or the project. It seems to me that the success of the project would automatically protect one's position. But, no! These folks wanted success for sure, but only if their group was the one in power when that success occurred. I saw this same problem at a Sony subsidiary and another TV network I worked at in the mid 80s ~ early 90s; and you can readily see this same problem in Japanese politics anytime anywhere. I was, and am still to this day, astounded at the immaturity of some of these people. As an aside, at my son's annual school festival, the Korean families always run their "Korea booth" featuring delicacies from their home. It's a wonderful time for all. I was chairperson of the PTA committee one year and was able to witness first hand how the Korean team worked. It surprised me that the women worked in the exact same pecking order as their husbands had at work; the wife of the highest ranking executive was the boss of the Korean booth; wives of second tier executives were second in-charge, and so on. There seemed to be no friction; just total teamwork. Everyone was certainly facing the same way and the boss of the Korea Booth proudly told me, "We are striving to sell the most food and give the biggest donation of any country to the school and charity!" She was dead serious about it too. There goes that "Korea against the world!" again. Several weeks ago, well before it had "only" 100 million views, I posted the video about Korean sensation PSY on a video countdown weeks before it exploded on the consciousness of Americans and the Japanese. At that time, the video had about three times more views than the entire population of South Korea! I was astounded! Nevertheless, after posting the video, some small minded people came out and made silly comments like, "Oh, he's just copying the Japanese." Or, a week ago or so, after the song because popular in the USA, I saw an article on Yahoo (America) that said, "Will PSY be a one-hit wonder?" Yeah, I wish I could be even a 1/100th of a one-hit hit wonder. My video would then still have over 3 million views! What the heck! The guy sings in Korean! Probably he will be a one-hit wonder in the USA. But, so what? 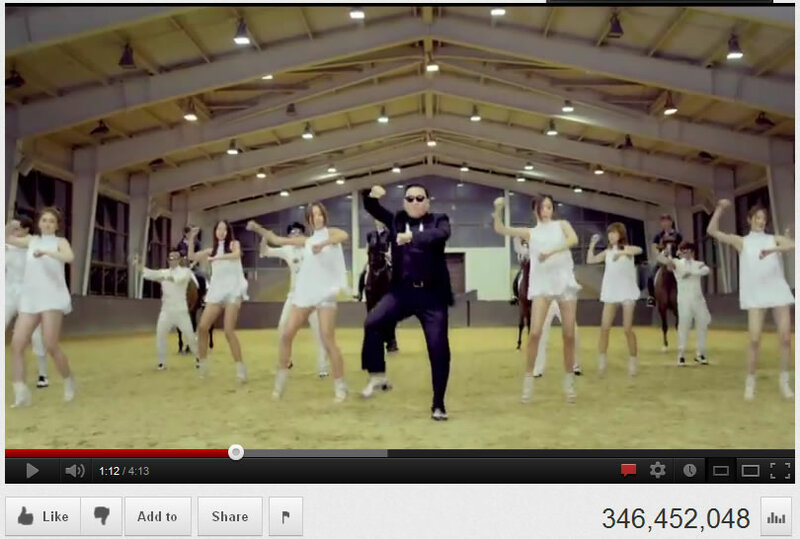 The guy's video, "Gangnam Style" has, as of this moment, 319,052,309 views! That's the most viewed video in history! That more than twice the views of Justin Beiber's "Boyfriend." PSY might possibly be one of the biggest stars in Korea, possibly Asia, in all of history. Not bad for a guy who "copies" stuff or is a "one hit wonder," eh? Why are people so jealous of these Korean success stories? I am happy and pleased to see guys like PSY and companies like Samsung doing so well. Competition is healthy and competition makes us all up the quality of our game. Those who chatter and grouse only show their immaturity and lack of self-reflection and professionalism.... We need to learn from them because, well, as they say, "the best revenge is success" and it seems the Koreans are doing quite nicely thank you. I really hate to say this because I am half-Japanese, but, sometimes I think MacArthur was right when he said, "Japan is a nation of twelve-year-olds." If the Japanese don't snap out of it and get with the program and start all dedicating their efforts to the success of the project, rather than protection of their position, they're going to become a nation of very poor twelve-year-olds.